Muscular dystrophy (MD) is a group of muscle diseases characterized by non-functional muscle proteins that impair proper function. In muscular dystrophy (MD) the proteins dystrophin and the dystrophin protein complexes are altered. Progression of muscular dystrophies includes death of muscle tissue. Several types of MD exist including Duchenne MD, Becker, limb-girdle, congenital, facioscapulohumeral, myotonic, oculopharyngeal, distal, and Emery-Dreifuss MD. dystrophin: A cytoplasmic structural protein that is deficient in some forms of muscular dystrophy. muscular dystrophy: A group of genetic diseases that cause progressive skeletal muscle weakness, defects in muscle proteins, and the death of muscle cells and tissue. Muscular dystrophy (MD) is a group of muscle diseases characterized by the creation of non-functional muscle proteins that weakens muscles and impairs proper function. Specifically the proteins dystrophin and the dystrophin protein complexes are altered and nonfunctional, unable to join with actin filaments. This leads to disruptions of mechanical stabilization and calcium concentration regulation within the sarcomeres, altering the ability of filaments to bind and cause contraction. Progression of the disease includes death of muscle tissue. 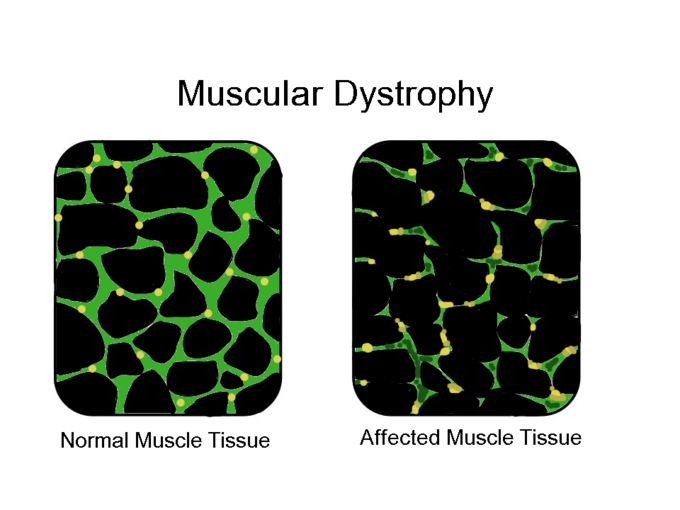 Muscular Dystrophy: In affected muscle the tissue becomes disorganized and the concentration of dystrophin (green) is greatly reduced. Several types of MD exist, including Duchenne MD, the first description of a MD disease, noted by Guillame Duchenne, a French neurologist, after study of 13 young boys presenting symptoms. Other forms include Becker, limb-girdle, congenital, facioscapulohumeral, myotonic, oculopharyngeal, distal, and Emery-Dreifuss MD. Most of these diseases affect multiple organ systems including the cardiovascular, gastrointestinal, nervous, and endocrine systems. Although not typically affecting intellectual abilities, a subset of MD patients do exhibit cognitive impairment, behavioral, vision, and speech problems likely linked to MD, and this is seen particularly in DMD. MD-affected individuals with susceptible intellectual impairment are diagnosed through molecular characteristics but not through problems associated with disability. Muscular dystrophy is generally an inherited disease, with men affected at much higher rates than women. Women are often carriers of the disease gene variant, but not affected themselves, although other patterns of inheritance exist for the different types of MD. However, mutations of the dystrophin gene and nutritional defects (with no genetics history) at the prenatal stage are also possible in about 33% of people affected by DMD.